I just hope wasps don’t find it first and take over. I bought this for a friend who wants to naturalize her yard as much as possible. The bee house is quite diminutive so you can find different places to put it that will be unobtrusive. Mason bees are particularly attractive because not only do they pollinate, but they don't sting. The only thing I didn't know beforehand is that the bees are only available in our area in the spring. So I told her the bees will be her March birthday present. The house looks like it will withstand the weather in the Northwest, and she says she's found the perfect location for early sun on the hive and she'll be able to watch the bees come and go. My son and his husband are thrilled with this hive. It's good-looking and will be great in their natural garden. Now my other son-in-law wants one! A great gift for your garden.... or someone else’s garden! This year this house for solitary bees was on my list of meaningful gifts. It is no secret that our bugs and pollinators are on the decline and under attack. One of the ways to not only improve your own habitat for pollinators such as mason and orchard bees, but to educate the next generation of guardians is setting up these solitary bee hives. Not only can you feel good about providing housing, you can also open it to show kids and adults the impact of the housing. It can be cleaned out and reused too!! I am excited to put some of these out on our farm this spring. Received on time and not only well built it's 'cute' - this is exactly what I have been looking for - for my garden. We are getting more and more different Bees and I already have a Mason Bee home. I wish we could have a Bee hive for all the honey Bees I see in our yard - there is already a hive in our area. This is for the Single Bees. My grandson was very excited to receive this bee hive. It is sturdy and attractive and comes with clear instructions. He's looking forward to some bee visitors. I gave this to an entomologist friend who can’t stop raving about it, but one doesn’t need any special training to enjoy it, just a love of nature. On the technical side, though, my friend tells me that the bees actually, and quite naturally, use it! He’s had hours of watching their comings and goings. Bees love it, so do I, Going to have to order more !! very well made !! I'm loving this! It's smaller than it appears in the pictures, but the bees will love it, I'm sure! It's nestled in amongst my hummingbird garden, and I have a bee water dish there, too - a pie plate with rocks in it and the water only up to the top of the rocks. Bees can drink and won't drown! Put a hotel—or two—in your yard. 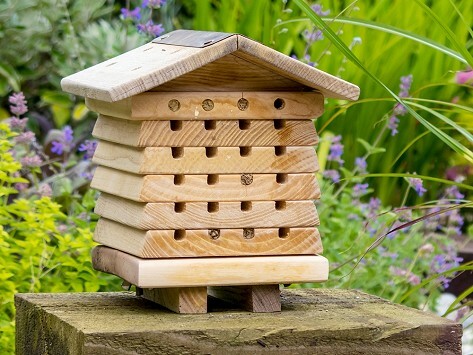 Attract beneficial insects and animals into your local ecology with these beautifully designed habitat houses. 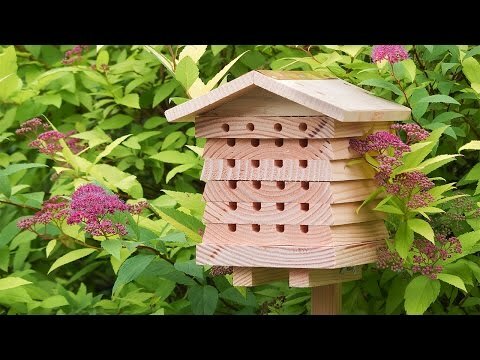 The folks at Wildlife World put a lot of thought and care into their designs, testing out everything from their bat boxes to butterfly habitats on a 35-acre farm in the UK. Each one is sustainably built, with timber that’s FSC certified and sourced from well-managed forests and other elements (like plastic or metal) that’s recycled. Each little habitat doesn’t just look adorable, it also suits the needs of its guests while helping out your surroundings. Bees and butterflies pollinate, which helps keep your garden lush; while bats and frogs ward off pests.